Los Angeles : Childish Gambino won Song of the Year for "This Is America" becoming the first rap track in the history of the Grammys to get the award. Gambino's scathing video about gun violence had a massively viral release last May and remained one of the most talked-about musical moments of 2018. "This Is America" won Song of the Year, one of the Grammys four top honours, over fellow nominees including Black Panther's hit single "All the Stars" and Drake's "God's Plan". Country singer Kacey Musgraves won the 2019 Grammy Abum of the Year award for her critically acclaimed, genre-bending record "Golden Hour". 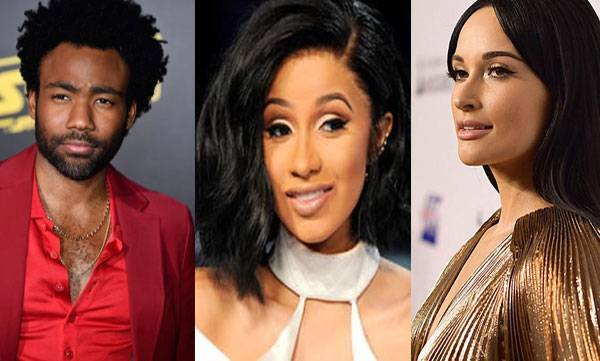 Musgraves defeated H.E.R., Brandi Carlile, Drake, Black Panther: The Album (various artists), Post Malone, Cardi B and Janelle Monae to win the biggest award of the ceremony. The album was co-produced by Musgraves, Ian Fitchuk, and Daniel Tashian. Cardi B on Monday created history by becoming the first female to win the Best Rap Album Grammy award.